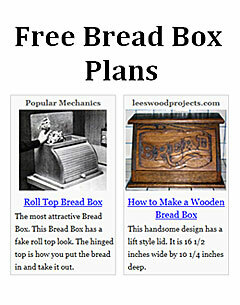 The most complete bread box plan comes from totally-free-woodworking-plans.com. They have a great 6 page pdf with over twenty diagrams located at the bottom of their page. They also provide some brief instructions on the front page. 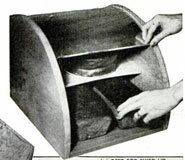 The most attractive plan is from Popular Mechanics Magazine and looks like a fancy roll top bread box. 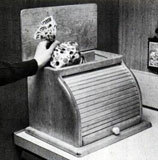 However the roll top is fake and the bread is accessed through a hinged top cover. Another plan that comes from Popular Mechanics has a sliding metal lid with a horizontal divider rack so you can use all the space in the box without stacking the bread on top of each other. The most complete plan with multiple diagrams with measurements and parts list. It opens in the front. 16 in. wide by 11 in. deep. The most attractive Bread Box. This Bread Box has a fake roll top look. The hinged top is how you put the bread in and take it out. This handsome design has a lift style lid. 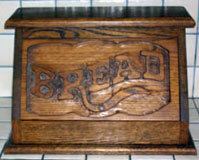 It is 16 1/2 inches wide by 10 1/4 inches deep. Has small cut diagrams, material list and direction. Does not have a full diagram. This Bread Box has a wooden body with a divider shelf. The door is made from metal cookie sheets.